BBC Sport outlines who was promoted and relegated - and who won the race for Europe - in England and Scotland. Chelsea secured their fourth Premier League title by beating Crystal Palace 1-0 on 3 May. They will be joined in the Champions League group stage by Manchester City and Arsenal, while fourth-placed Manchester United will enter the preceding play-off round. Tottenham qualified for the Europa League by virtue of their fifth-place finish, and they will be joined by Liverpool, whose sixth-place finish means they inherit the Europa League slot awarded to Capital One Cup winners Chelsea. They go straight into the group stages. Seventh-placed Southampton take the third Europa League slot after Arsenal's FA Cup victory over Aston Villa. They enter the competition in the third qualifying round. England was also granted an extra Europa League place as one of the top three countries in Uefa's Respect Fair Play league - which goes to West Ham, who will enter the first qualifying round in early July after topping the Premier League's fair play table. 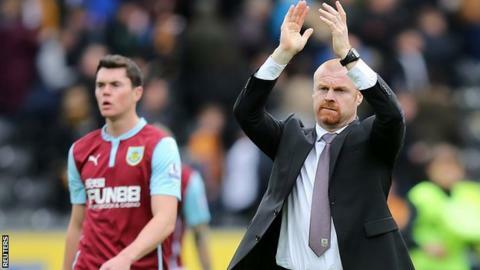 Burnley became the first team to be relegated to the Championship on 9 May despite a 1-0 win at Hull. QPR joined them the next day when they were thrashed 6-0 by Manchester City, and Hull were the final team to be relegated after they drew 0-0 with Manchester United on the last day of the league season. Bournemouth were promoted as champions after winning 3-0 at Charlton on the final day of the regular season while Watford, who had confirmed their Premier League place on 25 April, were denied the title when they conceded a last-minute equaliser against Sheffield Wednesday on 2 May. Norwich will join them in the top flight after beating Middlesbrough 2-0 in the play-off final. At the bottom, Blackpool were the first Football League team to go down this season, after fellow strugglers Rotherham beat Brighton 1-0 on 6 April. The Millers' 2-1 win over Reading on 28 April meant Wigan and Millwall filled the remaining relegation places. Bristol City secured the first of two automatic promotion places with a 6-0 win at Bradford on 14 April, and then secured the title with the point they needed in a 0-0 draw against Coventry. Milton Keynes Dons joined them in the Championship with a 5-1 victory over Yeovil on the final day of the regular season, and Preston became the third side to secure promotion when they beat Swindon 4-0 in the play-off final. At the bottom, Yeovil were condemned to a second straight relegation after a draw against Notts County on 11 April. Leyton Orient, Crawley and Notts County were also relegated on the final day of the regular season. Burton were the first team to secure promotion by winning 2-1 at Morecambe on 18 April and they clinched the title with a 3-2 success at Cambridge on the final day. Shrewsbury went up by beating Cheltenham 1-0 on 25 April and Bury's1-0 win at Tranmere on 2 May gave them the final automatic place. Southend claimed the final promotion place after defeating Wycombe in a dramatic play-off final at Wembley. The bottom two teams - Cheltenham and Tranmere - are relegated to the Conference Premier (or the National League as it will be called next season). Champions Barnet are promoted to League Two along with Bristol Rovers, who secured an immediate return to the Football League after beating Grimsby on penalties in the play-off final. The bottom four teams are relegated, with AFC Telford the first team in England's top five divisions to drop down on 4 April after they could only draw 1-1 with Kidderminster. Subsequently, Welling's win against Wrexham on 14 April condemned both Dartford and Nuneaton to relegation. The last place was filled by Alfreton. The relegated clubs will be replaced by Conference North champions Barrow and play-off winners Guiseley, and Conference South champions Bromley and play-off winners Boreham Wood. Celtic are champions for the fourth year in a row, securing the title on 2 May with three games to spare, and will enter the Champions League in the second qualifying round. Runners-up Aberdeen and third-placed Inverness Caledonian Thistle will play in the Europa League next season. Falkirk miss out on Europe after losing to Inverness in the Scottish Cup final, so Scotland's final European place goes to St Johnstone, fourth in the Premiership. The cup winners enter the competition in the second qualifying round, and the clubs who qualify via their league position start in the first qualifying round. St Mirren's nine-year stay in the top tier came to an end when Motherwell beat Kilmarnock on 8 May, ensuring St Mirren's relegation. Motherwell, the 11th-placed side, preserved their placed in the Premiership by beating Championship side Rangers 3-0 on 31 May, completing a 6-1 aggregate victory in the play-off final. Hearts clinched the title and an immediate return to the Premiership on 22 March after rivals Hibernian lost 2-0 to Rangers. Bottom club Cowdenbeath were relegated to League One, while ninth-placed team Alloa avoided the drop by winning a play-off with three League One sides, beating Brechin and Forfar. Morton were promoted as champions after they beat Peterhead on 2 May. They will be the only team promoted after ninth-placed Championship side Alloa won the play-offs. Ninth-placed Stenhousemuir avoided relegation by winning a play-off with three League Two teams, beating Queen's Park 2-1 on aggregate in the final. Bottom team Stirling Albion were relegated to League Two after losing 2-1 at Brechin on 11 April. Albion Rovers wrapped up the title and promotion with a 3-2 win at Clyde on 18 April. They will be the only team promoted after ninth-placed League One side Stenhousemuir won the play-offs. Montrose, who finished bottom, beat Highland League champions Brora Rangers 3-2 over two legs to secure the final place in next season's League Two.